Danish artist Julie Sass studied at the Art Academy in Copenhagen and at New York University, NYC, where she graduated with a Masters in Fine Art degree in 2000. She also holds an MA in Theory and Communication, from the Academy of Fine Arts in Copenhagen, where she now lives and works. Focusing on Abstraction and how visual art can be embedded in various contexts, Sass is known for her divergent (yet overall coherent) approach to her solo exhibitions and her collaboration with different artists and museums. I recently visited her at Steinprent, the graphic workshop in Tórshavn, to see how the preparations were going for her exhibition, including a new artists’ book titled BLACK FOG RISING, too. The exhibition opens to the public today, Saturday 30 March including the launching of an artist book, which has become a major project for both Sass and Steinprent’s staff. During a stormy week in Tórshavn, at times it has felt as though the furious weather conditions continue inside the Steinprent workshop and gallery where everyone has been busy with their different roles in preparing for Sass’s latest show here. Finding the artist downstairs in the gallery, together with the lithographer and head of Steinprent, Jan Andersson, where they were discussing the mounting of a large textile work that she has created, I wondered if this was the right time to suggest I interview her for Art North? Naturally she had a lot on her mind. BLACK FOG RISING is the first solo show by Julie Sass in The Faroe Islands, but she has collaborated with Steinprent on numerous occasions previously, including not just her lithographic work but her artists’ books: Volume Rhythm Matter dialogues (2017) and Lemon Mood (2018), which was launched at EKELY Gallery, Copenhagen, last year. The collaboration relationship between Sass and Steinprent started six years ago, however, and since then she has exhibited with the Faroese abstract artist Rannva Kunoy and Hansina Iversen, both of whom (in her capacity as a curator) Sass has included in exhibitions. For her current solo show, BLACK FOG RISING, Sass has created a new body of work, including litho prints, heliographs, drawings, paintings, the aforementioned textile work, a window installation with neon lights, a poster, and a special edition of the artist’s book, including an additional print on Japanese ‘gampi’ paper. To say that her new exhibition is a multidisciplinary tour de force is an understatement. Meeting her, I found the artist concerned about some paintings that haven’t yet arrived, but Julie found both time and energy for an interview, and her generosity, I find, is a characteristic behaviour for which she is widely known. Sass always presents herself in a gentle, calm way, even even though the situation might be stressful. My first question concerned the starting point of Sass’s projects - Where does Julie Sass begin? “My starting point is somehow exactly the same place where I last finished up. When I work on something, a painting, a book, or a show, it eventually seems to be closing when the process has reached its final stages. Later on it will again bring my attention to different ‘stuff’ which has not been expressed yet and has new possibilities. Overall, I think there is continuity between each project or exhibition, and it was in this manner that the book BLACK FOG RISING was initiated. In many ways it is a natural continuation of Lemon Mood, and yet it is completely different. It has been a dream for me to write a new types of texts that may mimic painting without being paintings, and without being about paintings. Instead of using images as illustrations or comments for a text I turn these conditions around, because through that I can try to apply the approach of abstract painting as a methodical baseline in the creation of the book and that is exciting – I’m very interested in breaking down hierarchies. What I’m trying to do with my text is transform the narration so that we lose track of time and place and in some way ‘enter a space’, similar to abstraction. Viewed as a whole (as exhibitions, books, individual drawings or paintings) Sass’s output seems to be playful, overall. In all of them there seems to be an awareness of the relationship between a sensual and an analytical approach, focusing on the interrelations between forms on the surface, both in individual pieces and across her wider body of work. Her paintings have the feeling of being built or constructed, rather than painted and this method appears important to her in several ways. It’s as if the artist wants the viewer to be aware of the process (which she keeps open for as long as she can). She once described her works as journeys, and I think it is interesting how all her work seems to be pervaded by a sense of procedure and process. No wonder she likes to work in Steinprent where the process is part of the lithographic technique. It is fascinating to watch her work in the graphic workshop where all the elements are created to fit into a single entity that is constantly changing due to the constant flow of new elements and ideas. My conversation with Julie about this project began when the workshop was literally covered with her visual notes and works in progress. In the midst of this creative process and situation, she explained to me first her latest artists’ book that she has created in Steinprent over recent weeks, but which has been carefully prepared for many months in her own studio. The book features seventeen heliographs and lithographic prints, and eight short poetic and fictional texts. The images are divided in ‘chapter’ format in the book, and the texts are placed at the end, as a final chapter in their own right. The Preface in the book is a picture; a beautiful, simple and open triangular figure in dark indigo blue, imitating the kind of pen you might use to take notes. 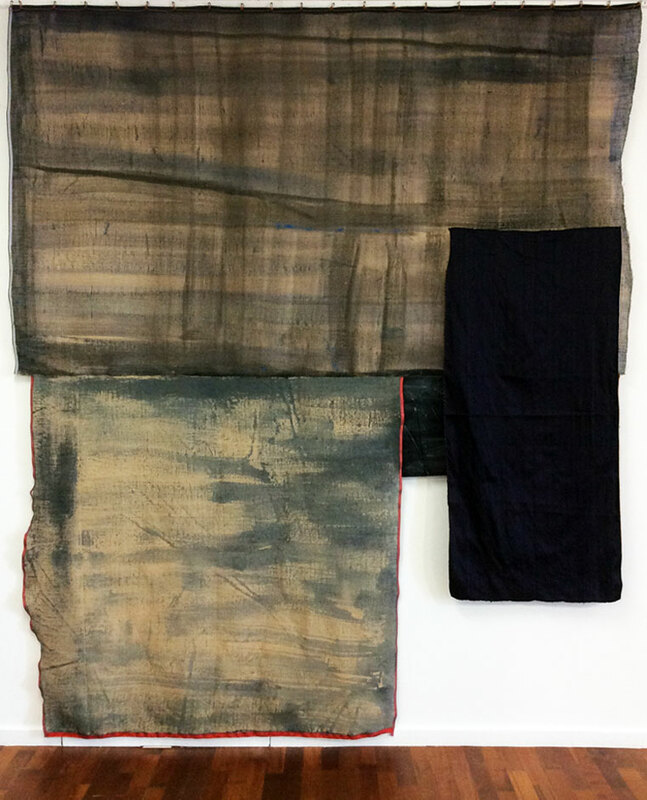 “This is a sort of opening,” Sass explains, and I understand that there are several openings in BLACK FOG RISING, serving as a meta-layer of painting with its overlaps and references to lived life (which, according to the artist, cannot be woven into a single painting or work). This is, in a sense, a continuation of the structure in Lemon Mood, therefore, but in the new book the text in itself is almost abstract – to begin with, there are no placenames, so the characters in it seem to frequent a world of the unknown. A breaking down of gender binaries is insinuated, too, as if ‘he/she’ shifts into a ‘we’; people and general observations are almost commonplace, with overlapping textures and ‘senses’. – “Well, this was my plan,” Jule adds laughing. She doesn’t know if she succeeded, though. She also mentions a book by the German artist Jutta Koethers as a source of inspiration.